Greifensee, Switzerland. 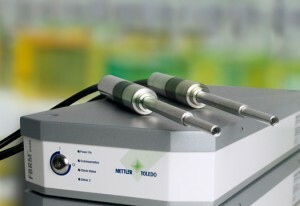 6 September, 2012 — METTLER TOLEDO has published a new white paper on bioprocess monitoring entitled “Fermentation: Inline Real-Time Monitoring of Key Process Parameters.” It reviews four examples of how the inline probe-based technologies, ReactIRTM inline mid-IR spectroscopy and Focused Beam Reflectance Measurement (FBRM®), provide real-time information on fermentation processes, enabling immediate detection of process deviations and sound decisions on effective process control. Each case study illustrates that the non-invasive and non-destructive inline monitoring technologies such as ReactIRTM and FBRM® will continue to gain ground in bioprocess manufacturing as consumer demand for pure, safe, bio-active products increases. Inline ReactIR™ mid-IR spectroscopy simultaneously measures, in real time, the concentration of multiple components of the growth medium and metabolites during the course of a fermentation process. In the first two case studies, ReactIRTM monitored the concentration of key media components, tracking nutrient consumption and metabolite production. The recent advances in hardware and software have made ReactIR™ amenable for use by those not experts in spectroscopy or process modeling. In the last two case studies, FBRM® tracked changes in biomass concentration and morphology in real time. This information was used to control feed strategies that met the high metabolic demands of each culture medium. FBRM® sensitivity to bacteria size, shape and count provided critical information on the degree and rate of change for both high-density and complex filamentous bacteria cultures. Overall, the profiled experiments indicated that inline measurements of key process parameters provide significantly more high-quality data from start-to-finish than can typically be gained by using either traditional inline bioreactors or offline sampling. In turn, those measurements enabled the implementation of effective process control strategies that can help reduce batch-to-batch variability and improve product recovery when necessary.